Lady Montdore winning the Glen Falls Stakes (photo via NYRA). Seven fillies and mares, whose connections hope make the gate for the Nov. 3 Maker’s Mark Breeders’ Cup Filly & Mare Turf (GIT) at Churchill Downs, are set to race 1 ¼ miles in Belmont Park’s $500,000 Flower Bowl Stakes (GIT), a Breeders’ Cup Challenge “Win and You’re In” event for the division — the last BC qualifying race of the year. Since the first Breeders’ Cup Filly & Mare Turf was contested in 1999, the Flower Bowl has been a major prep. 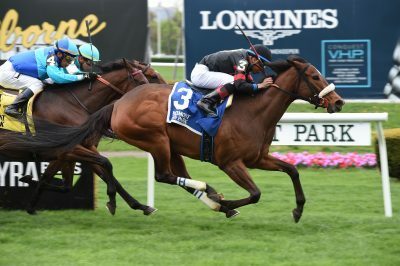 And though only Soaring Softly in the first year, Lahudood in 2007 and Stephanie’s Kitten in 2015, have pulled off the double, a number of good horses have won this race before strong performances in the World Championships, most notably champion fan favorite and miracle horse Lady Eli, who won here in 2016 before finishing second to Queen’s Trust at Santa Anita. Glens Falls Stakes (GIIT) winner Lady Montdore will attempt to capture her third consecutive race since shipping to America in May. 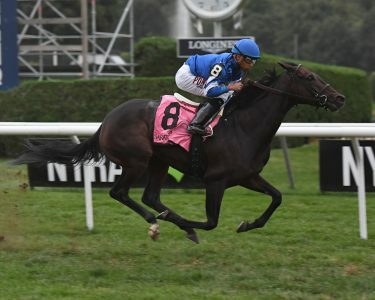 Trained by Tom Albertrani for Godolphin, the daughter of Medaglia d’Oro and the Grade 1 winner Hystericalady (Distorted Humor) came back after an 11-month break to win her U.S. debut in August and, then, came back with a frontrunning Glens Falls victory. She has only raced on turf and her three wins have come over both “soft” and “good” courses, which should help her here. “When I first got her, there wasn’t too much to her,” Albertrani said. “She’s got a light frame and was just kind of light in general, but as I started to train her more and more, she started to get my attention. We got to really liking her, as we got closer to starting her. Even before she ran the first time, I really thought she would run well. I think it just took some time for her to really mature. “We were very lucky with the way she came out of her first race and were able to go on to win the Glens Falls, where she was impressive again. 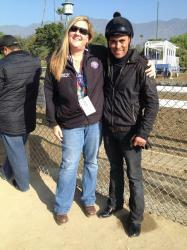 Lady Montdore will again be ridden by Manny Franco and the pair will break from post 2. Trainer Chad Brown, who has saddled four winners of this race, will tighten the girth on a talented pair in Fourstar Crook and Onthemoonagain. New York-bred Fourstar Crook was a strong second to stablemate Sister Charlie in the Beverly D Stakes (GIT) on Arlington Million last out and, while the talented daughter of Freud hasn’t started a lot in 2018, she has been consistent, winning two and finishing second two other times — all in graded company. She’s won on ground from firm to yielding and will like a quick early pace. It’s easy to see why this 6-year-old mare has earned 7-5 morning line favoritism. Irad Ortiz Jr. will be back aboard from the outermost post position. Holy Helena (photo via NYRA). Brown’s other charge, Onthemoonagain, will make her third start since shipping to America after a good campaign in France last year. So far, she has yet to win here, but the daughter of Cape Cross was third in a tough optional claiming race on the turf at Saratoga in August before running fourth in the Glens Falls. Hall of Famer Javier Castellano will ride Onthemoonagain from the inside. Stronach Stable’s Grade 2 winner and Canadian champion Holy Helena will make her first start off a more than three-month layoff. The daughter of Ghostzapper won last year’s Queen’s Plate and also the Woodbine Oaks, so, this year, her connections decided because she was so successful on Woodbine’s synthetic surface, she’d likely be successful on turf. They were right as she won her first three grass races, including The Very One Stakes (GIIT) and Sheepshead Bay (GIIT). A couple of lackluster starts earned her a slight break and she’s back here for trainer Jimmy Jerkens. Junior Alvarado picks up the mount aboard Holy Helena and will ride from post 3. Completing the field for the Flower Bowl are Tricky Escape, who is riding a three-race win stakes-winning streak; Danceland, the third-place finisher in the Glens Falls in her last star; and Feeling Bossy, who was well beaten in stakes compnly against fellow New York-breds two weeks ago. Post time for the Flower Bowl, which is the 8th on the card, is 5:18 p.m. ET. What Kind of Layoff Horses Win Most?